Our 25th wedding anniversary celebrations started a day early with my sister and her partner Steven turning up expectantly to share a drink with us for our anniversary and they bought this dirty great big box of chocolates and bubbly. Davina and her SIL made this for us. John bought me this gorgeous silver jewellery set with little purple gems in it. Very pretty. Apart form our night away I bought John a silver anniverary frame and popped the most recent (until last night) photo of the two of us in it. 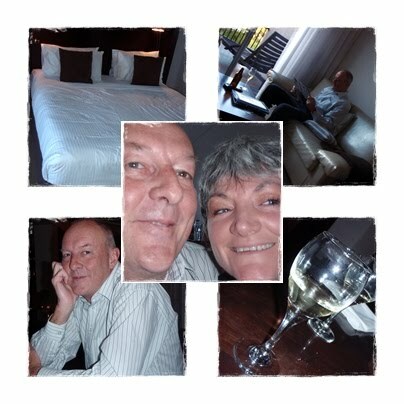 After I finished work we headed to Gerringong and our night away from home. While we were there John booked his & Haylee's trip to Ireland next Easter. We stayed at the beautiful Bellachara Boutique Motel in Gerringong and had dinner in their restaurant. I forgot to take photos of our meals. I had roasted beetroot with puy lentils and fetta salad s, followed by beef fillets with a herbed polenta cake and baby vegetables and for dessert a passion fruit parfait with a sesame tuille. John had brie & Riesling soup with walnuts and pan fried ocean trout. On the way home today we did a little shopping. I came away with 2 shrugs, a red & a purple one. AND two pairs of shoes. 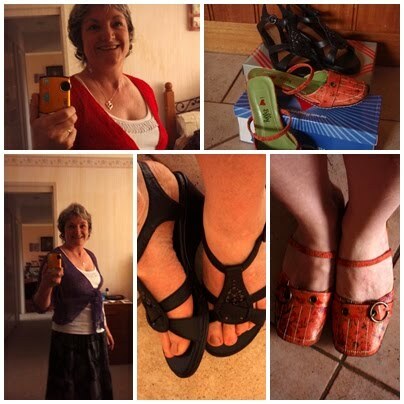 I finally found a pair of black sandals that I can wear to work (only been looking for 2 years for the right pair) and how gorgeous are these little orange shoes, you can wear them as I have on here or put the strap behind your ankles. Don't forget about my giveaway . You get an entry by commenting on each of my posts, thats one for each post and if you become a follower and let me know thats another entry. You and John can have some quiet evenings sipping champers, eating chocs and enjoying each other company with that big box of goodies! Re the shoes... I was wondering if you were trying to catch up to Imelda Marcos, remember her? She had 100's of pairs of shoes trying to satisfy her shoe fetish. I think you have better taste though :). Happy 25th Wedding anniversary ... looks like you celebrated in style!! Thanks for visiting my blog at sliprail.blogspot.com - and Happy Anniversary too! Love the gift box of bubbly and chocolates. Oh this is such a happy post. Congratulations on your anniversary. Your night away sounds so special. That box of chocolates and goodies looks yum. I love the orange shoes! I really need to get more exciting shoes in my collection. I've become boring lately. Lovely shoes, Gail. The black ones look so comfy! Wow that is one big basket of choccies/bubbly and such a lovely gift. and the shoes - whoo hoo :) yes! and to the nite away - FaB !! glad for you Gail :) that's an accomplishment worth celebrating! Love the shoes and the jewelry. and you and John look very happy.